Although it is true that no two humans know exactly the same things, they often have a great deal of knowledge in common. To a large extent this common knowledge or collective memory allows people to communicate, to work together, and to live together. E. D. Hirsch, Jr., Professor of English at the University of Virginia, Joseph F. Kett, chairman of the Department of History at the University of Virginia, and James Trefil, Professor of Physics at George Mason University, have authored The Dictionary of Cultural Literacy. This book points out thousands of the people, places, ideas, and events that shape our culture and our nation. The Bible, the holy book of Judaism and Christianity, is the most widely known book in the English-speaking world. No one in the English-speaking world can be considered literate without a basic knowledge of the Bible. All educated speakers of American English need to understand what is meant when someone describes a contest as being between David and Goliath, or whether a person who has the "wisdom of Solomon" is wise or foolish, or whether saying "My cup runneth over" means the person feels fortunate or unfortunate. The Bible is also essential for understanding many of the moral and spiritual values of our culture, whatever our religious beliefs. The story of Abraham and Isaac concerns our deepest feelings about the relations between parents and children. The story of Job is a major representation in our tradition of being patient during suffering. The Parables and sayings of Jesus, such as "Blessed are the meek, for they shall inherit the earth," are so often alluded to that they need to be known by Americans of all faiths. 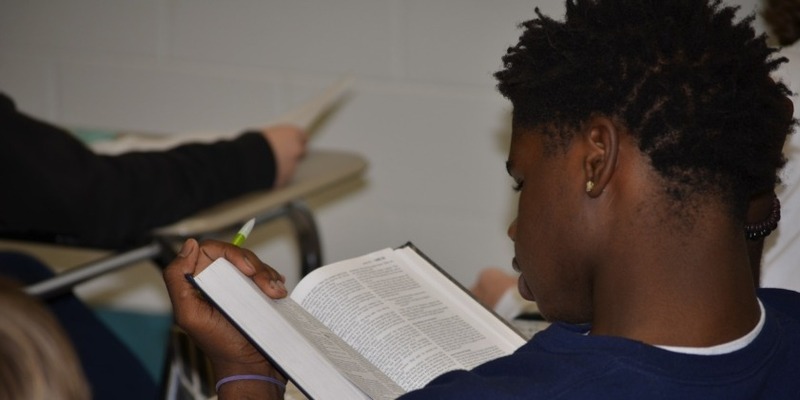 Read this short, compelling essay in The Wall Street Journal, "Why Public Schools Should Teach the Bible."